Bridget Bernadette Karn: Artist Using Wool To Make Felt Pictures. 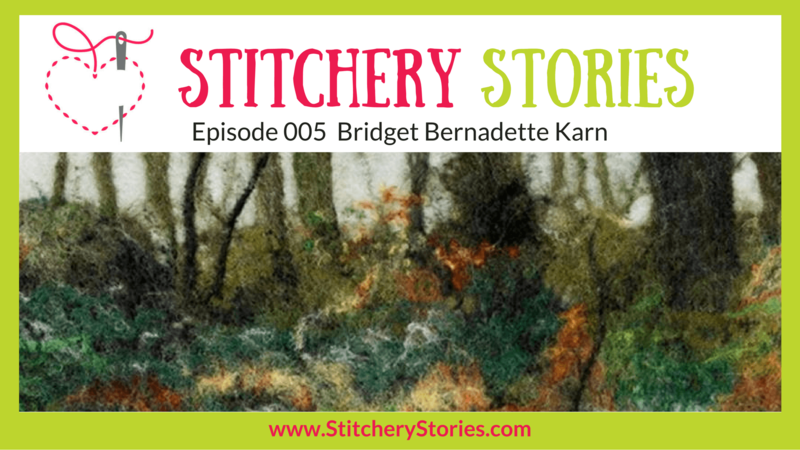 Today on the Stitchery Stories podcast, Bridget Bernadette Karn Shares Her Life In Wool & Felt. She chats with Susan Weeks about discovering wet felting and creating a business based around that newly discovered love, leading to being selected for the Royal Academy Of Arts Summer Exhibition. A beautiful video which spotlights Bridget and her art has been a powerful tool in attracting worldwide interest in Bridget’s art and has led to Bridget creating her first online course which launched in July 2017. Continue reading to discover the highlights of our chat and to see examples of Bridget’s work. 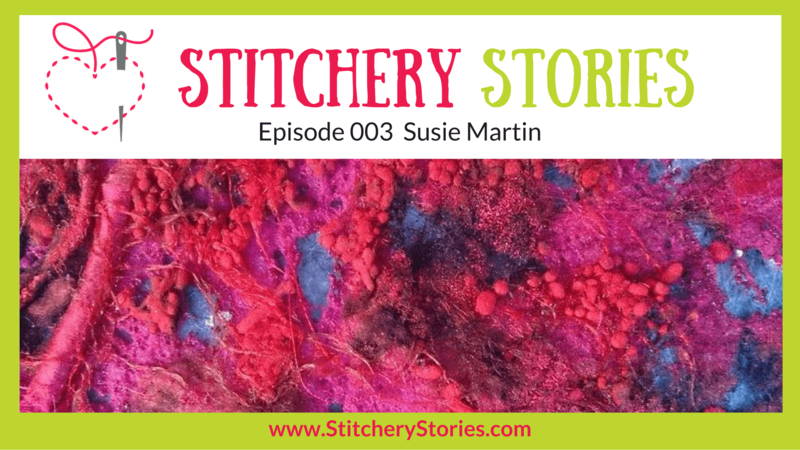 Today on the Stitchery Stories podcast, Susie Martin Shares Her Life In Fabric & Thread. She chats with Susan Weeks about her embroidery textile art journey from mixed media art, and how she loves creating new fabrics and colourful surfaces with layers and textures. She also shares her enjoyment at being an active member of the Embroiderer’s Guild. 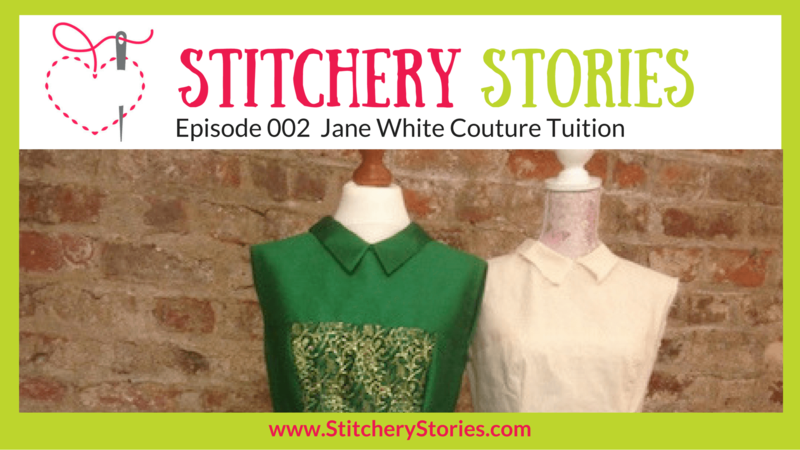 Today on the Stitchery Stories podcast, Jane White Shares Her Life In Fabric & Thread. She chats with Susan Weeks about her love of dressmaking, pattern cutting, fashion, couture and of course using a sewing machine and overlocker. 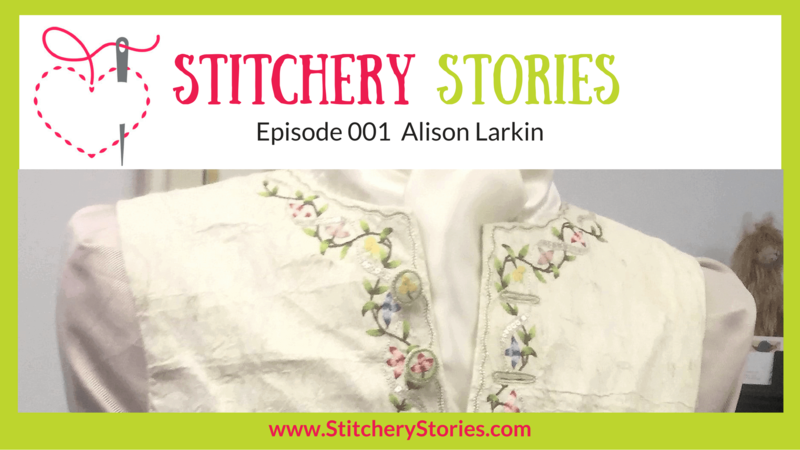 Alison Larkin Shares Her Life In Fabric & Thread here on the Stitchery Stories embroidery podcast . She chats with Susan Weeks about her love of historical hand embroidery and 18th century historical costume – particularly waistcoats. Alison chats about her fascinating project to re-create and then finish Captain James Cook’s ‘unfinished’ waistcoat. His wife Elizabeth started it for him but sadly he died before she finished it. Alison researched the story and the actual waistcoat to faithfully make her finished copy – which is absolutely beautiful!